The theme includes both a grunge & clean version, along with the option to use a traditional dark on light approach or a light on dark style. And then you will also have 5 different colour schemes (default – grey, blue, orange, green & pink) to choose from for each of these 4 style options, which makes it 20 possible colour / style combo’s in total. The 4-column grid structure of the homepage acts as a complete “aggregator” of what you are doing online. As mentioned above, we’ve tried to design a theme with a whole lot of personality, which will allow you to really publish yourself online. In our mind, this aspect of THiCK makes it a truly unique theme across the alternatives that are available to you. So for THiCK, we’d like to highlight the widget-functionality, along with the truckload of custom widgets we’ve integrated with the theme. The theme has 3 different widgetized spaces (left and right sidebar, along with the middle column on the homepage), which can either display our custom, THiCK-specific widgets or any default WordPress widgets. For the custom widgets, we’ve included a custom category list, the lifestream widget, asides / sideblog, built-in recent comments, your favourites (Movies, Books etc. ), as well as Flickr & Social Media Profiles. 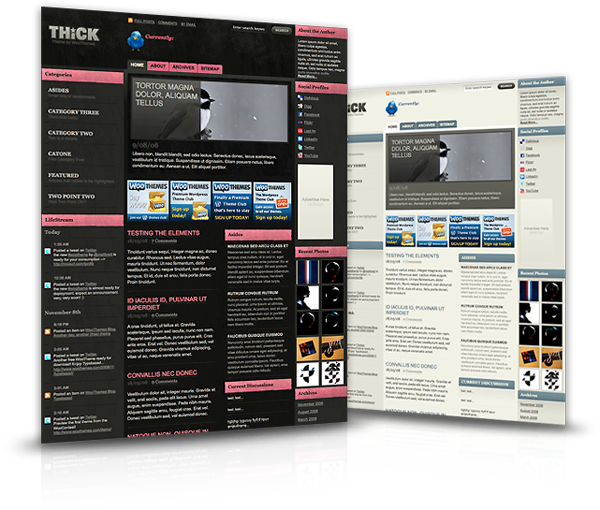 THiCK is probably our second theme (after Over Easy) that integrates such extensive use of widgets and the reason for this, is that we feel it increases your options, as the user of the theme. This approach has been very well received by users of Over Easy and we hope to get the same positive feedback from THiCK users.